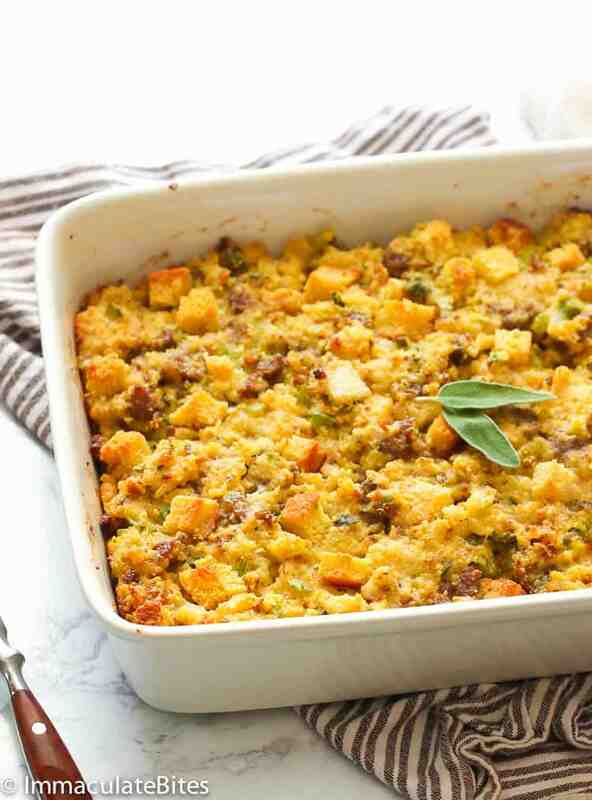 Cornbread Dressing – a Southern classic Thanksgiving dish made from cubed bread and cornbread, butter, sausage, eggs and a handful of easy-to-find ingredients. Moist, well-seasoned and so comforting side dish! There’s one thing that I learned during Thanksgiving: you can never have too many casserole dishes. 😉 Actually, I got that from my big sister who loves gracing her Thanksgiving table with a variety of casserole dishes like this Sweet Potato Casserole and Green Bean Casserole. Since we won’t be travelling down South to celebrate Thanksgiving with them, I’ll be posting one of her most-raved casserole dishes – Cornbread Dressing. What is a cornbread dressing? Cornbread dressing is a classic Thanksgiving must have in the Southern part of the U.S. It’s also kind of a personal thing, too, as every grandma’s have their own recipe for creating this soul satisfying side dish. It is primarily made of crumbled breads and a few days old cornbread (the drier, the better), celery, sausage, sage, herbs and spices, milk and a good stock. Savory, moist and DELICIOUS! If you think turkey could easily claim the spotlight during Thanksgiving, cornbread dressing sometimes rival that one, too. How can you not fall in love with this baked casserole dish full of wonderful and comforting flavors? 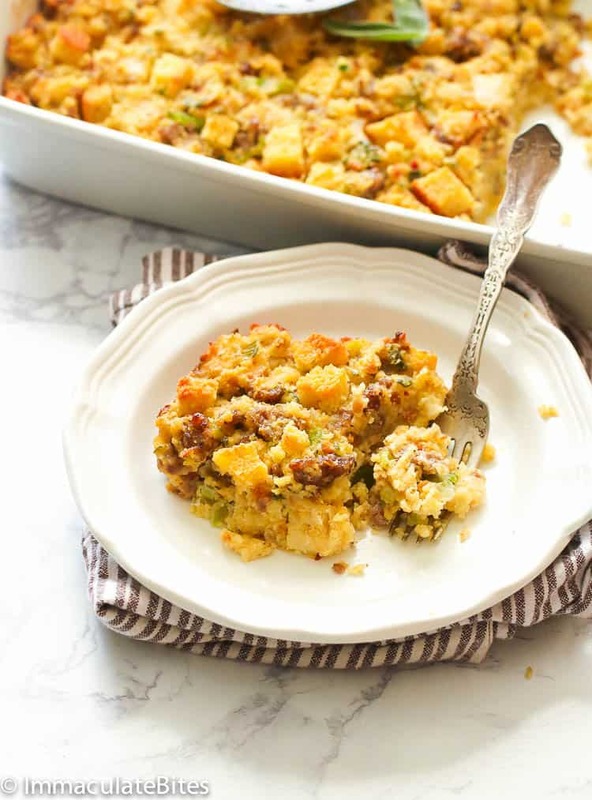 Is cornbread dressing the same as stuffing? Like any word feud, there will always be a heated debate during the holidays between the difference of stuffing and dressing. 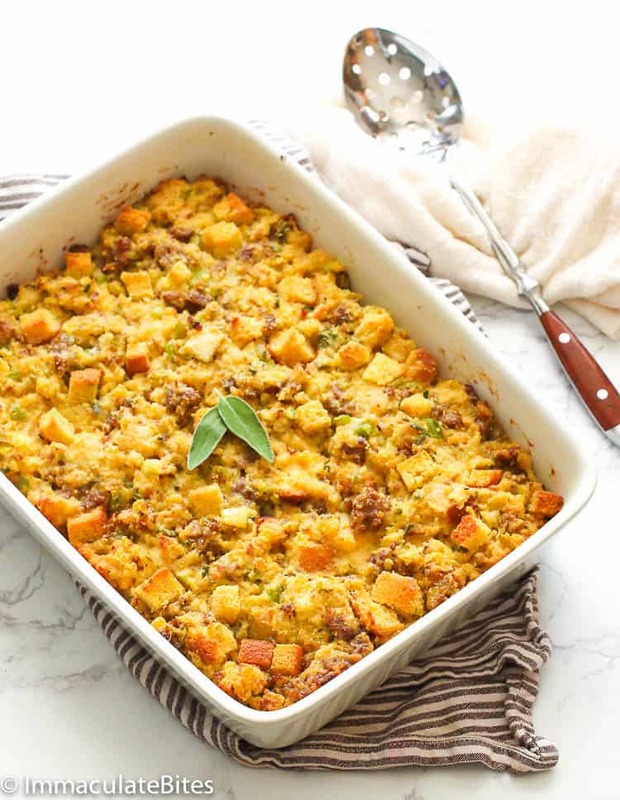 Most Southerners would call this kind of dish as stuffing (even if its baked separately in a baking dish) while in other parts of the country it’s called dressing. 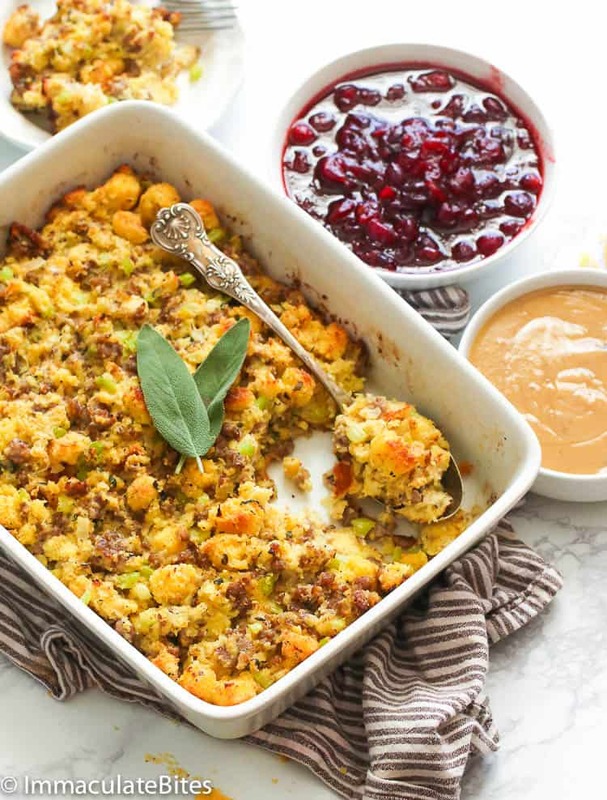 Some would say that it’s all about the ingredients: stuffing if it uses bread and dressing for cornbread. Or it’d still boil down as to where you live. 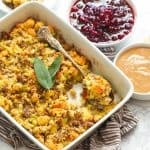 Technically, stuffing is referred to a mixture used to stuff another food before cooking; like for an instance, a turkey stuffed with cornbread, apple or sausage mixture. A dressing on the other hand is an accompaniment baked separately from in a baking dish. 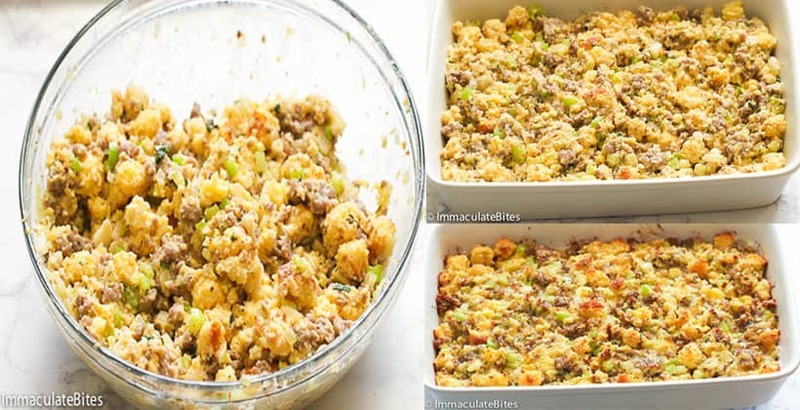 Regardless on which side you are on, we can all agree that this Thanksgiving cornbread dressing is damn delicious and easy to prepare than we think it is. Honestly, I don’t care if it’s served to me inside from a turkey or on the side in a casserole. All I want is seconds and thirds of this! Can you make cornbread dressing the day before? Yes, you sure can. You can make the CORNBREAD for this dressing the day before. For this recipe, it’s best to use a few days old cornbread as it makes the best dressing. Just wrap it tightly and place it in your fridge until you’re ready to mix it with your dressing. Another option is to prepare the mixture ahead without baking up to two weeks in advance and wrap it tightly before placing in the freezer. When ready to bake, just thaw it in the fridge a day or two prior to use. Serve this scrumptious cornbread dressing alongside with your baked chicken or turkey and top it with this creamy and delightful homemade cranberry sauce (which I’ll be posting here real soon). When using a chicken stock, go for the low-sodium ones as the regular ones are too salty to my taste. Make sure to use a day or few days old cornbread as the dry ones make the best dressing. If you wants some extra savory flavor, use about a tablespoon of bacon fat in addition to the butter when sauteing the mixture. 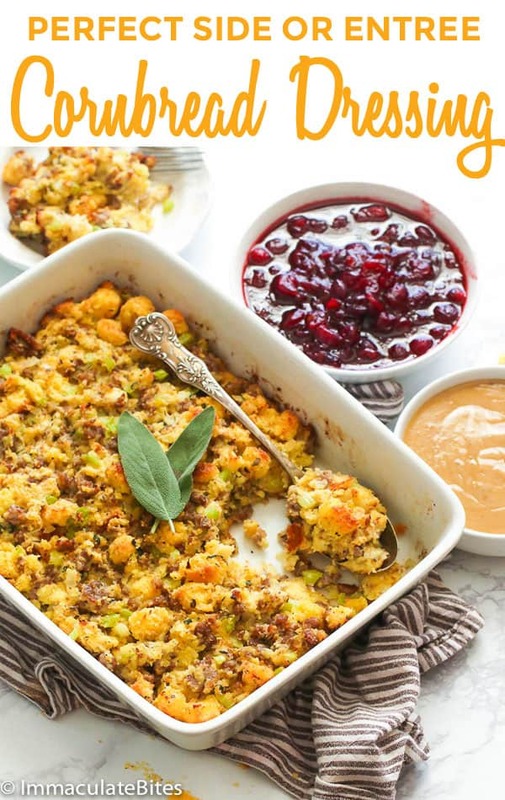 Cornbread Dressing – a Southern classic Thanksgiving dish made from cubed breads and cornbread, butter, sausage, eggs and a handful of easy-to-find ingredients. Moist, well-seasoned and so comforting side dish! Spray or generously butter a 9×13 baking dish or an oven proof dish with nonstick cooking spray. Set aside. Place a large skillet over medium heat, let it warm up. Then add breakfast sausage, break into chunks using a wooden spoon. Let it cook while stirring for about 3 -5 minutes. Add about a tablespoon butter to the sausage , followed by onions, celery, garlic , Italian herbs , sage and thyme, cook until onions is soft or wilted, about 3-5 minutes. Remove from heat. In a large bowl, combine day old cornbread and bread cubes . In a medium bowl, thoroughly mix together half and half and eggs . Pour the egg mixture evenly over the cornbread mixture. Next, add the sausage and onion mixture together with all it’s juice. Gently fold in cornbread mixtur , so it’s combined taking care not to mash cornbread. Add chicken stock and continue folding until moisten. Mixture should be moist. Taste to check for seasoning and season with salt. Bake at 350 degrees until it is hot all the way through and is crusty on top, about 35 to 40minutes . Start checking at 30minutes. Place a large skillet over medium heat, let it warm up . Then add breakfast sausage , break into chunks using a wooden spoon. Let it cook while stirring for about 3 -5 minutes. Add about a tablespoon butter to the sausage , followed by onions, celery garlic , Italian herbs , sage and thyme, cook until onions is soft or wilted , about 3-5 minutes Remove from heat. In a large bowl combine day old cornbread and bread cubes. In a medium bowl thoroughly mix together half and half and eggs. Pour the egg mixture evenly over the cornbread mixture. Next, add the sausage and onion mixture together with all it’s juice. Gently fold in cornbread mixture, so it’s combined taking care not to mash cornbread. Add chicken stock and continue folding , until moisten. Mixture should be moist. Taste to check for seasoning and season with salt. Transfer to a greased baking dish. Cut butter into small slivers and scatter on top of dressing. Bake at 350 degrees until it is hot all the way through and is crusty on top, about 35 to 40 minutes. Wohoo! Thank you for the wonderful feedback. I’m so happy it all turned out well for you, Charlotte. 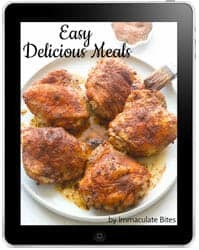 I love all your recipes- so delicious !!! Not enough days off to make them all !! Can I make the stuffing now – I’m celebrating Mondaytge 19th because I have to work the actual holiday ! Just curious how far in advance I can make it without freezing ?? Aww thanks Krista , A day in advance, you can prep; the sausage , cornbread and bread a day ahead . Then mix and bake the day of the event, for best results . Can you publish a Pork Chop Recipe please. My pork chops comes out kinda dry.